A valid credit card is required to secure your reservation. Full non-refundable payment will be charged upon booking confirmation. Strictly no refund for cancellation/modification/no show or shorten stay. · You must be at least 18 years of age to check-in and reserve for a room. · A valid credit card is required to secure your reservation. Full non-refundable payment will be charged upon booking confirmation. Strictly no refund for cancellation/modification/no show or shorten stay. · In the event guest completes a booking based on a rate that has been incorrectly posted, Hotel reserves the right to correct the rate or cancel the reservation at its discretion. · Children who are 11 or younger sleep for free in the existing bedding of a room shared with a paying adult. Children who are 12 years old and above are considered as adults and have to sleep in separate beds. · Extra beds are not available for all room types. · All requests are subject to availability upon check in. · Check-in time is from 3:00 pm and check-out time is by 12:00 noon. · A valid passport is required at check-in. · Luggage storage is available.However, owing to limited space, luggage storage is on first come first served basis. Overnight luggage storage is not allowed. Please approach our Hotel Ambassador for assistance upon your arrival and departure. If arriving early, you are also advised to consider making a reservation for the evening prior to your arrival. · Late check out is subject to room availability and additional charges applied. We reserve the right to remove all personal items of the guest who does not show up on time.
. No gatherings and parties of any nature are allowed on our premises. We reserve the right to evict unauthorized visitors. · The property may, at its absolute discretion, cancel the reservation if the property is in the opinion that the reservation information provided is falsified or incomplete. · Visitors are not allowed into the rooms. · Animal/pets are not allowed within hotel premises. · T​o ensure all guests enjoy the comfort and safety of the facilities we offer, we uphold a strict zero tolerance policy towards commotion, excessive noise and parties. · Please treat our staff with respect, any guests caught with inappropriate conduct or behavior, after the allegations have been investigated, the property reserves the right to take action against the guest which may result in, but not limited to, being asked to leave without a refund for any services incurred.
. The property shall be entitled to vary, amend and/or otherwise change these terms and conditions at any time without prior notice. · The property shall not be liable for any losses, damages, costs or expenses incurred by you as a result of any cancellation of the reservation by the property. · Guests are responsible to take good care of their personal belongings and valuables. The Management will not be responsible for any loss of items during your stay with us. Caravel is a mid-scale boutique hotel, which reflects a modern interpretation of Macau’s heritage. Creatively themed, the Maritime Explorer concept lets its guests take on an adventurous role, beyond the beaten path, to explore Macau in lively spirits and alternative insights. The creative, personable, and adventurous traits of the brand are relayed to its guests through the design, interaction and environment of the premise itself. Exploration starts the moment guests enter their rooms. The boutique hotel experience is one of a kind as guests are immediately immersed in the spirit and true flavours of Macau. Each level of the property is also designed elaborately in different landscapes and dispositions, mostly zooming in on the different parts of the picturesque Macau. 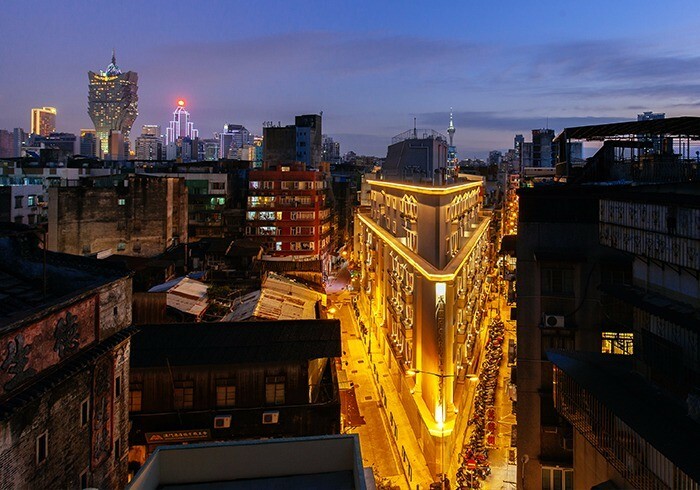 Not only is Caravel strategically located for guests to have convenient access to key attractions in Macau, guests can also choose the path less taken to explore the untouched old charm of the unique city.